There has been needless furore over my statement communicating President Tsvangirai’s position that Vice President Nelson Chamisa is now the acting President. For the record, I have been communicating the President’s messages for almost a decade. He has entrusted me with the position of being his official spokesperson and he has shared with me many confidential matters; some for the press and some not for the press. That has been the nature of our relationship. It must be noted that in September 2017, President Tsvangirai left an MDC Alliance workshop in Kadoma and went for treatment in South Africa. He left VP Khupe as acting President and we communicated the same. On 5 January 2018, the president appointed Vice President Hon. Enginer Elias Mudzuri as acting President and again I communicated the same to everyone. On the 7th of February 2018, he appointed Hon Chamisa as acting President. There is a pattern about these appointments because as of now all three of his deputies have acted in his absence. I want to place it on record that I am the official spokesperson of the President and what I place on the market are his views as instructed personally by him. That position has not changed. 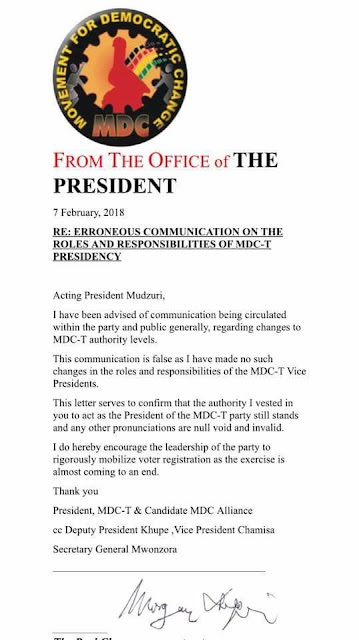 I also want to place it on record that there is a purported statement from the Office of the President that seeks to nullify what the President himself directed that I communicate. For the record, that letter is on a fraudulent letterhead with a scanned signature of the President, which signature is readily available online. The Office of the President has not released such a letterhead to anyone and the President, who is currently in SA, has not asked for it for him to place his purported letter. In short, the so-called letter is fraudulent and bogus. Acting President Chamisa has already assumed his responsibilities, albeit in an acting capacity as directed by the President. He has addressed the parliamentary caucus and will be meeting provincial chairpersons this afternoon. I wish to state that the stampede in the cockpit is needless and unnecessary. The President remains unwell but is stable. Our behavior and deportment in these trying moments for our President must enhance the towering brand of Morgan Tsvangirai and not seek to undermine it. Unfortunately, this needless stampede by political vultures is disrespectful of his wife and family as well as the towering edifice of brand Tsvangirai that has inspired Zimbabweans over the years.